‘Act on PAH – Improve patient outcomes with early diagnosis’was a live, interactive, educational meeting focused on reducing time to diagnosis of patients with suspected pulmonary arterial hypertension (PAH), a rare, rapidly progressive, life-limiting condition. ‘Act on PAH’ was developed, with input from PAH experts, for non-PH specialist physicians, nurses and those health professionals involved in echo. 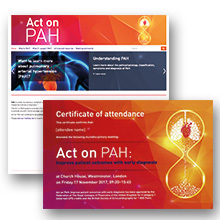 The objectives were to increase the awareness and understanding of PAH, and equip attendees with the knowledge and tools to identify and refer patients with suspected PAH earlier; resulting in earlier diagnosis, treatment and improved patient outcomes. The dynamic programme of interactive workshops and plenary sessions, delivered through varying styles, maximised audience interaction and motivated delegates to ‘Act on’ their learnings to implement immediate changes in referral behaviour and share their knowledge with colleagues. Patient and caregiver involvement ensured an emotive and inspiring experience throughout. This flagship event forms part of a wider ‘Act on PAH’ meetings programme to reduce time to diagnosis and ultimately improve outcomes for patients with PAH. This was a really strong entry and it had the audience from the very beginning. The testimonials were fantastic, the objectives were met and it was truly patient-centred. It was engaging and stood out for the judges.